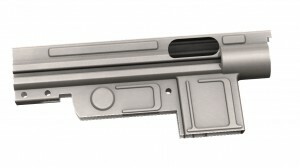 This is the bolt and bolt carrier for the Cetme model L.
It is part of the kit that I received from Apex gun parts. I also bought some of there magazines. It is a interesting looking gun and one that I am looking forward to build in the future. To this end a start has been made. As always the first step is to design the receiver so we can make stamping dies. A great deal of work has been accomplished toward this goal. Now it is necessary to get the last few measurements that we don’t currently have. So here are the solid models as they currently look. Still working on the internal block and how to convert to semi-auto only to meet ATFE requirements. It looks like a fun project and is on the list,but have the finish the VG1-5 first and a solid model project for our friend back east. I am thinking a 3 or 4 die stamping die set. Please tell me you’ll sell flats or receivers! Interesting to see. I have one of these on order and it should be here this week. 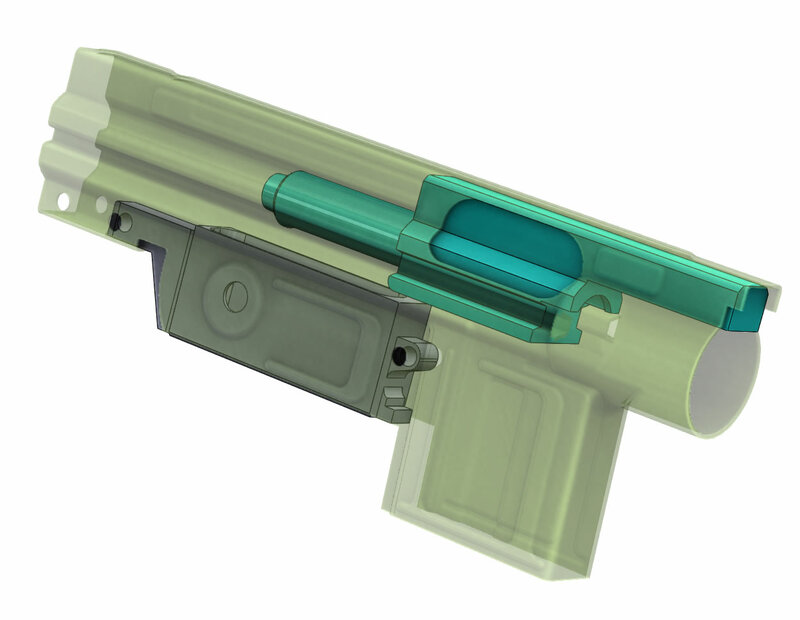 Have you tried the magazines in an AR(etc)? I didn’t buy any, because of having read that they were a weak point for this rifle. Work great in my AR, just dosent engage the bolt hold open on last round. Either use as is or replace follower with a magpul or one of the israeli ones. Nice project, and a really nice gun: hope you will enjoy it. the last time i checked, the only person offering dies to make your own was offering them at something like 1000 or 1500$! i’m sorry but thats just insane for a set of dies. the most i’m willing to pay is say around 150$ or 200$. however, i think if you put out an incomplete but bent flat that required some welding and other finishing touches to make it operational – that would be a much better and appreciated idea..
We are planning to sell the flats and internal block. How close is that “L” solid model to actual dimensions? Suppose the green finish will be difficult to recreate. We are looking into that. I really want the correct color. 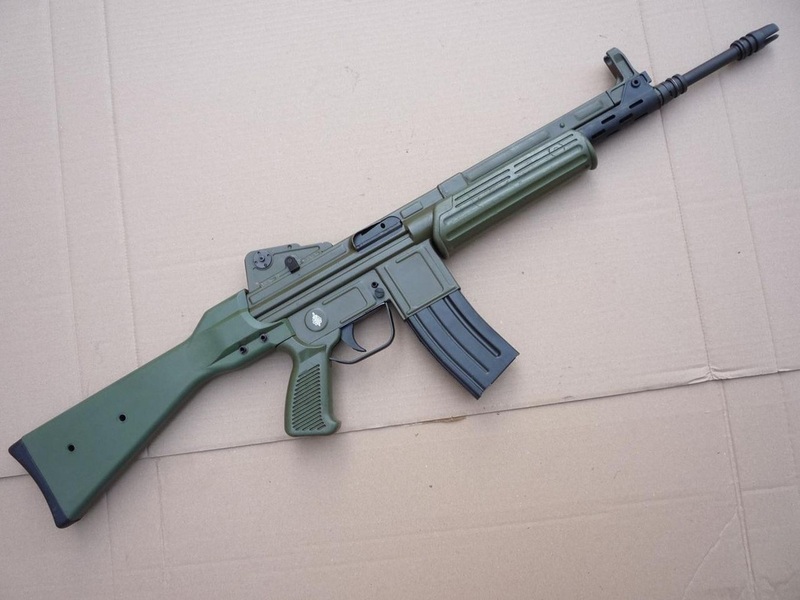 Hi, my name is Sergio, i´m form Spain and y have a complete CETME L (disable). If you need my help to know measures and other thing I´ll help you willingly. What would be excellent is if you have a local (in Spaon) 3D scan house scan the receiver into a 3D model so that it could be checked against the one Chuck has made. I will take you up on the help as I am still missing a few dimensions. First of all, thanks for your interest in this piece of our history. In our country the .223 cartridge is banned to civilians. I have access to an disabled CETME L. It has the barrel and bolt drilled, but the receiver is in good and original condition. So, if you show me the measurements you need, I will try to help with the measurements and pictures. Thanks and I will be contacting you. About de magazines, It is correct that they were the main source of problems for the rifle. 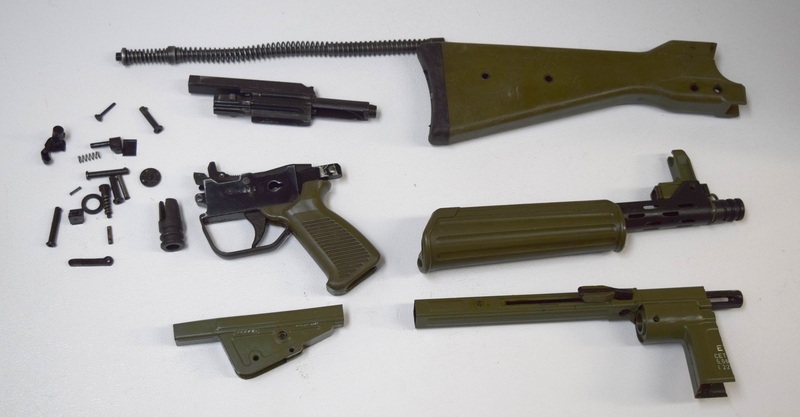 The initial idea was having one-use magazines, very cheap and obviously quite weak, to supply the soldiers with pre-filled magazines instead of cartridges. But, of course, the Army started to re-use the magazines, and in a short time the magazine lips bended and cause malfunctions. 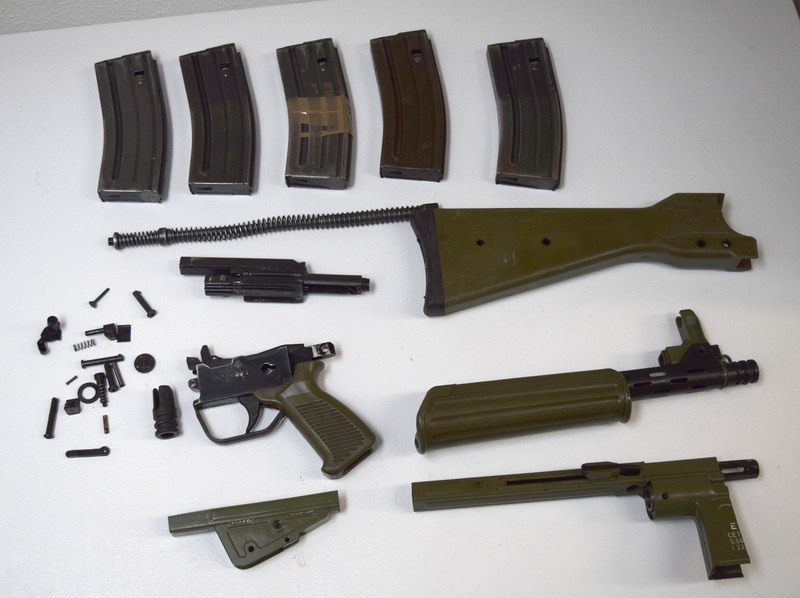 The solution was using standard NATO magazines (they are compatible) and forget the idea of one-use magazines. So, I think standard GI AR-15 magazines should work in the CETME L. The otherway around I am not so sure…. The measurements on this website picture are the ones that we would like to see if they are accurate. They are only estimates at this time. Thank you. P.S. I cannot seem to just attach the picture. For JB: It would be great find a 3D scan house, I´ll search for it. For Chuck: I can´t see the picture of yout link ¿Can you see my e-mail? I´m going to look over some data in an article bout CETME that I writed in 2007. It would be good to see the picture with the measurements that you are missing. Sergio, anything you can come up with would be of great help…thanks. 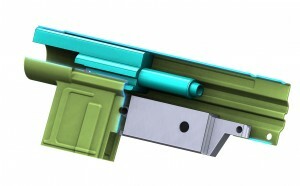 Pictures of the chamber end of the barrel(inside the receiver)would be nice, if you can. There is very little information except for the illustrations from the PDF manual that’s on line. I’ve been in contact with a couple of people in Spain but nothing yet. Did CETME ever produce an armorers manual for the “L”? 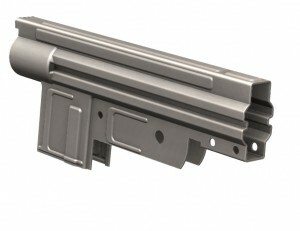 I’ve searched for quite some time looking for a loose barrel that may have been posted on line, even a lot of the Spanish forums, unfortunately one picture does not show the chamber end and the other that I found is very blurry. CHUCK: Feel free to fwd my email to Sergio, thanks and keep us posted. The link to the picture seems to be broken. If you can access to my email, feel free to send me an email. If you need me to put my email here, let me know. great post chuck cant wait to get one to put my kit together. thanks for your hard work. wait to get one to put my kit together. thanks for your hard work. How is the progress on these? Ready for an order? I have a Kit and will be looking for a builder as well. To me, this is the most interesting parts kit to come down the line in a long time. We have been working on the stamping dies. They are currently in the process of being made. We have the flat design and will send them to the laser cutter soon. If other people are working on them that is great also. 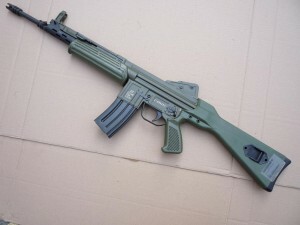 Does anyone know from where/ whom I can procure a CETME-LC collapsible buttstock? Are they available for sale in EU as spare part or as de-mil rifle? Any news on the flats? Hi. Any update on the project? I am looking for the CETME-L receiver flat. I can’t seem to find them for sale, any suggestions? Do you offer them, or if you have discontinued them would you be willing to sell your dies?